(2015-12-27 15:24:34)Whitepro Wrote: Seriously why is DR infinity in every single comic? What's so special about this guy? In light of Kinx joining AF I'll post this old comic based on a vm conversation we had. and I had reserved a post and to make up for it I made a comic and delivered. Where I come from, it's pronounced "Stallone"
An extraterrestrial alien man and his Time, Universe, Reality Dimensions and Space travelling machine (TURDS travelling machine) arrive on Earth and makes contact with the Greater World Federation, a nation that has seen its fair share of extraterrestrial life so his arrival isn't too much of a shock to the people. This alien's name is Doctor Infinity, a Timelord from New Gallileyifreyigan who is on the run from all sorts of hostile aliens and other intergalactic monstrosities. He meets Laurai Steele Katana, the GWF's foreign minister and Tank Rodriguez Titanium, the leader of the entire nation. They receive reports of unusual activity in some warehouse and head out to investigate. SO I gathered what little I saved of JV Comics before it went down into an imgur album. I had them nicely ordered, but imgur decided to thrash that when I uploaded everything... and part of me kinda likes it better this way. I tried to credit everyone for their work as far as I remembered. I put a bracketed question mark or two to mark my level of uncertainty on some of them, but most of them I feel had down. If you know who did a comic I was unsure about, or want one you made taken down for some reason, shoot me a message. Will be uploading a much smaller part two with some comics that were multi-part series. (2016-02-17 08:36:58)Ross Wrote: SO I gathered what little I saved of JV Comics before it went down into an imgur album. 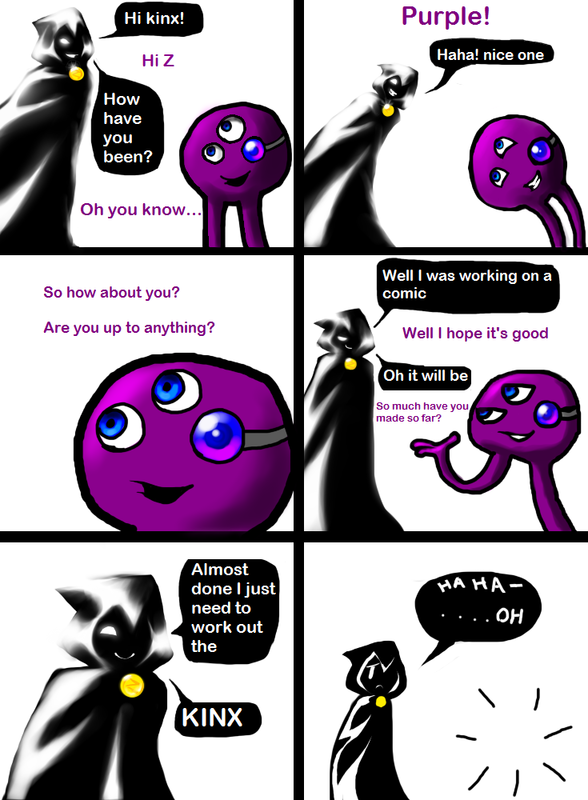 (2016-02-17 08:36:58)Ross Wrote: Will be uploading a much smaller part two with some comics that were multi-part series. Featuring Classic Amy and Super Smash JV. Again, if anyone wants to supply stuff I'm missing, I'm down. Christ, Ross, how many comics did you save? 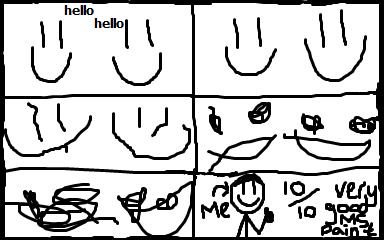 (2016-02-18 04:17:06)Skrillisus Wrote: Christ, Ross, how many comics did you save? Not enough. Thousands of souls are simply lost to the winds. I've uploaded almost everything that I had saved though. I think ffc said he was backing up comics at one point. dunno if he did that. Cola is 10 of your 5 a day! (2019-03-24 03:00:45)Verdusk Wrote: "Most dragons tend to hoard treasures, which they protect in their lair. This one collects colas." (2019-04-02 00:25:38)Robin Hood Wrote: While humans are 60% water, I know one particular dragon that's 60% cola. I deserve this. I deserve my kneecaps broken. I havent drawn something that wasnt on iscribble SINCE FOREVER. Also Kit's new weapon I guess? A baseball bat! Main Thread: A place for questions, comments and fan art relating to the story as well as an episode directory and bonus content! In this epic, over-the-top violent and gory, 3-part episode, the United Secret Service of Dolphin Intellectuals roll across the GWF-Rossiyan border in what is known as Operation Dolpharossia. What was expected to be a swift and easy victory, escalated into one of the biggest land battles of all time. It's a fight to the death, and neither side is holding back! But amidst the chaos and the horrors of war, an all-powerful demon watches in amusement. Some episodes of The Ravaged Streets contain graphic scenes of blood, violence and gore. It also portrays and makes references to real life historical events; some of which may be controversial. The characters in this comic series do not accurately reflect the people they are based on. Viewer's discretion is advised. Oh my God... I made this over a year ago and now that I look back at it, this is actually pretty freakin' terrifying. What the hell kind of state of mind was I in when I made these comics?! JESUS CHRIST!! I do remember your comics and I don't cringe at them at all. At least your comics were, for the most part, kid-friendly. Comparing is a big no-no for me when it comes to art. Some people may like an art piece while others may dislike it. Apples and oranges, my friend. They're only filtered for duplicates, so there are a lot of non-comic images. Nah, Just would like to see more material here. Jv is dead. Stop beating that dead horse. (2016-02-23 02:31:33)Shanaroo Wrote: Jv is dead. Stop beating that dead horse. 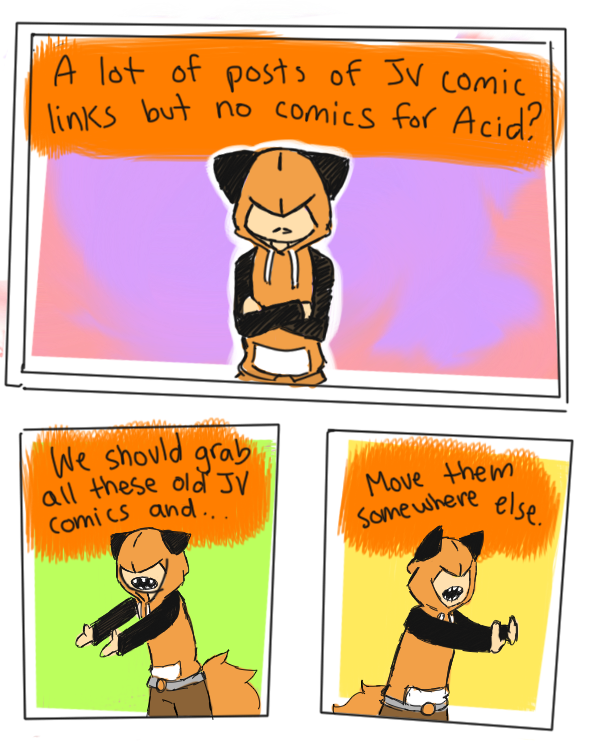 I don't really see the problem with sharing nostalgic comics. Don't think it's anywhere near "beating a dead horse" yet. And I doubt it's deterring people from wanting to contribute new comics either. Kinda makes me wanna share more new stuff here if anything. Current time: 2019-04-21, 20:14:50 Powered By MyBB 1.8.5, © 2002-2019 MyBB Group.